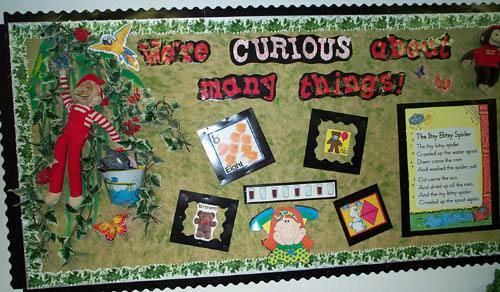 Merilee Withrow leaves this bulletin board up year-round in her preschool classroom. She changes the items on the board regularly. The pail holds three dimensional objects that start with the letter of the week. When they are studying the letter "E" the pail will hold a plastic egg, a stuffed elephant etc. Press "Go" to search for Curious George.